Most people accomplish about half of what Steve has in 25 short years. After high school he entered into an intense year long program to become a Firefighter/Paramedic. He not only passed but he was in the top of his class. Due to the hiring freeze for firefighters Steve has decided to temporarily put his firefighting career on hold. Steve has also received his USCG Captains license and is now driving the Loggerhead III on weekends and when the need arises during the week. Steve is the head waiter at the U-Tiki Beach restaurant during the week and is responsible for making it one of the most popular dining options in Jupiter. Steve is a Florida Native growing up in Jupiter his whole life, there are not many Natives left. When Steve is not diving or piloting the Loggerhead III you can find him riding waves at local beaches. I have seen video of him surfing and I would swear that it is video of a professional surfer. And it's not just local beaches you can also find him at Costa Rica or Nicaragua beaches. 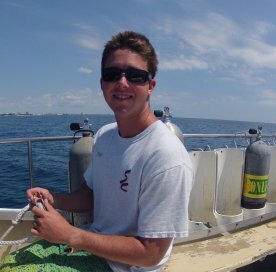 Steve loves to dive and is an incredible asset here at The Scuba Club. We could not do without him!